Just a quick post to announce a great initiative this summer, which is free to take part and can be enjoyed in and with your local community. The Nswt Bity Experience is providing a simple way to celebrate the history of African hair in your local barber shop or beauty salon. The event will take place between 21 July and 7 August 2017. 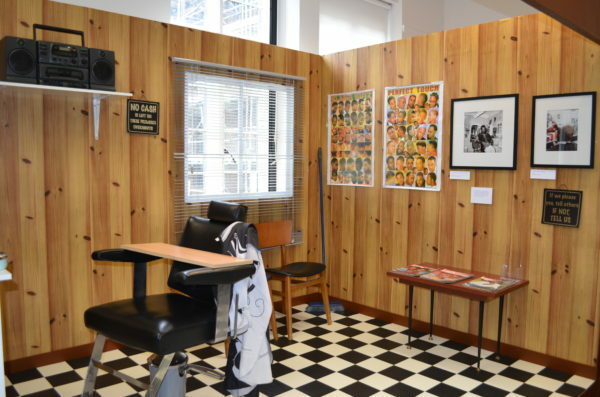 An installation of a traditional barbershop by the artist Michael McMillan. Museum of Archaeology and Anthropology, Cambridge. July-November 2013. 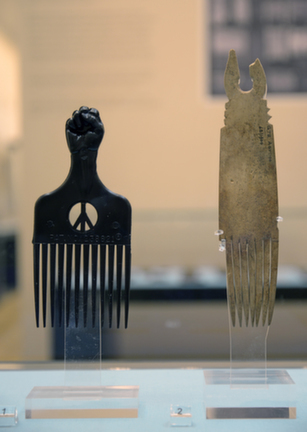 Part of the Origins of the Afro Comb Exhibition. The organisers have done all of the hard work by assembling images of Kemite objects and have provided all of the information ready for use. The idea is for barbershops and beauty salons to host a small photographic exhibition, to share knowledge, and to encourage families to learn more about the history of African hair. I fully endorse this project and hope that people will take part, share their experiences and keep the history of African hair and styling alive. Hello! I respect your work a great deal & thankful for everything, you have done to explain the great culture of Ancient Egypt. My question is this : Since you’re a Egyptologist. How hard would it be for you to find some early dynastic or middle kingdom mummies And get enough samples from them. Where a geneticist could test thier DNA and we could find out their origins? Because I believe. Once you test the DNA of the earliest kings of Egypt. It will end the Eurocentric myth that a “Superior Race” invaded Egypt and became it’s rulers. What do you think about that idea? What are your thoughts on movies like “Gods of Egypt” and ” the Mummy” where the representations of ancient Egyptians are historically inaccurate? Hi Stephine, nice to hear from you. From a psychological standpoint they are probably the most effective in whitewashing ancient Egypt. When people actually see reconstructions rather than looking at the original objects the images and people offer a strong visual message and at both a conscious and unconscious level these representations can become fixed in our brains. So when promoted with ‘Ancient Egypt’ it would be those images that someone would recall. Thank You, because I was arguing a point with a friend whereby she said its just a movie not reality, however the “place” is quite realistic since it existed and the representation should have been accurate. Likewise movies like “Roots” is fiction but however the Hollywood never made the mistake of casting Europeans as slaves in the Trans Atlantic Slave trade. It may be a movie but its still based on historical facts. Yes films such as Roots are good examples. It is also true that you wouldn’t find an actor of African origin playing Julius Caesar for example in a historical film. I guess in a way it is a form of appropriation so yes, in answer to your second question. The appropriation is of the cultural heritage, and the means to do this is by using actors who are of European descent rather than African origin. There does seem to be racial bias/racism in some Hollywood casting and it is a shame that directors don’t take opportunities to cast non-Europeans in lead roles for films based on Ancient Egypt – it wouldn’t hurt if they employed actors from the MENA and black folk. While Roots is fiction, it’s still based on historical fact whereas God’s of Egypt is fantasy so the comparison is a bit weak. Can you elaborate more on how it’s cultural appropriation – who is appropriating and from whom ? So in a way its like culture appropriation ?